San Clemente Raves About Our Faves, Again! 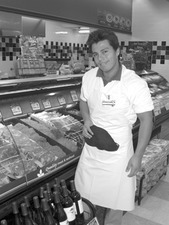 Kimm Hunt, the Office Manager for Dr. Peter Rothenberg claims, “one of my favorite employees here in San Clemente is Aaron, the butcher at the smaller Albertsons on Pico. He is always very polite and very friendly. We chat about everything from his school to his future plans, all the while he is hard at work. “I’ll wait for him to assist me even if he is with another customer, not only for his personality but he remembers what I like better than I do! The San Clemente Journal received these messages about the employees at businesses that we most frequent. Employees that we here at the Journal also felt deserved recognition for their exceptional service and their polite way of making us all feel welcome. Please feel free to nominate your favorite employees to shelly@sanclementejournal.com.